• 10 drops lavender essential oil. 1. Mix the soap and vinegar into the water. Next add the lavender essential oil. 2. If you don’t like the lavender fragrance, you can swap it out for your favorite essential oil. The towel works great, whether it is used dry or with a cleaning product. Best of all, your cleaning doesn’t hurt the environment by tossing individually used cloths in the trash after each cleaning session. 1. Loosely trace the shape of the Swiffer so there is about a half of an inch on the shorter ends and an inch to an inch and a half on the longer sides. 2. Cut the rectangle out of the towel. 3. Sew all of the sides. 4. Cut your ribbon into three-inch strips, you will have four pieces of ribbon. 5. If you are using a swifter, you can use the cloth holders as a marker for where to sew the pieces of ribbon. Sew a ribbon strip to the edge of towel on the longer side of the rectangle. 6. Repeat step five to the remaining three sides. 2. Use a Microfiber Cloth. A really easy way of covering a Swiffer for all you no-sew folks (like me). Simply wrap a microfiber cleaning cloth around the swiffer and tuck the edges into the "grabbers". Most cloths will be wider than the swiffer, however, you can simply fold over the edges a couple times to get to the right size. The microfiber cloths do a good job of picking up the dust, hair, etc. After cleaning the floors, pick off the bigger clumps of gunk and throw the cloth in the washing machine. 6. Throw a Sock On It! Another "no-sew" option for folks who don't knit, crochet, sew, or even have a microfiber cloth hanging around the house, here's your inspiration. 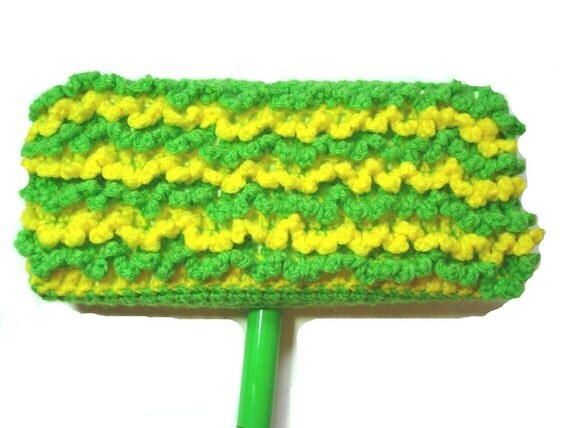 Find a tube sock and you too can make your own swiffer cover! Thanks for featuring my tutorial! I love all the other ideas, too! Thank you for your eco-craftiness and for sharing your gift with the rest of us! Thanks! We're working toward less waste - this it mighty helpful. Good for you! Every little bit counts!